Natalie and Lauren both have hand, foot and mouth disease and have been kept home from school for the week. Actually, all their cousins have it, too, except for Michael and Ashley. 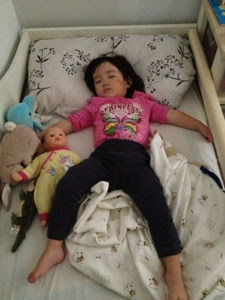 Aside from a 1-day fever, the girls are alert and energetic as usual, but possibly still contagious. To help keep Ashley HFM-free, Porpor took Natalie and Lauren to Lisa's to play yesterday and to Carol's today. Looks like the girls are having a great time! 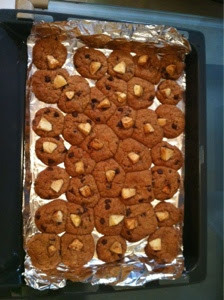 They baked cookies at Lisa's. 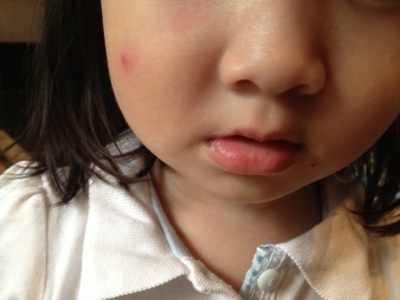 Lauren had two red bumps appear around her lips. Natalie had no external signs except for inside her throat. Everyday, the kids have eaten popsicles (lucky them!) which is cooling for their throats and hydrating, too. 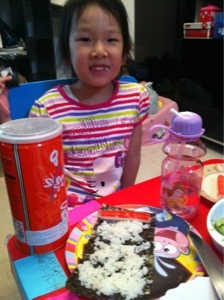 At Lisa's, the kids made their own sushi rolls for lunch. 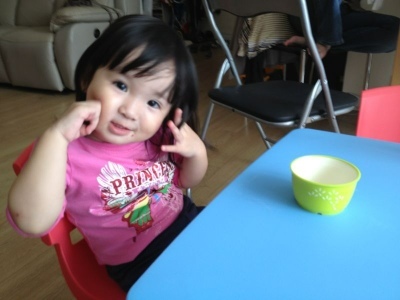 Natalie ate two BIG rolls - she was extra hungry because she hardly ate anything the day before when she had a fever. 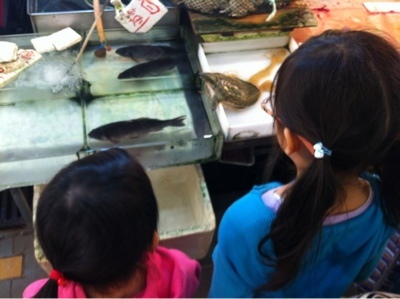 They also went shopping at the wet market with Por-por where they purchased a "live" turtle. The turtle got made into a confinement soup for me (thanks Por-por!). Lauren took some big naps. 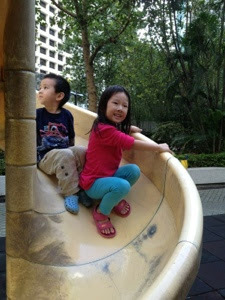 At Carol's, the girls had a chance to play at the City Garden park again, just like old times! Lauren is much braver at going down the slide by herself. Natalie and her cousin Vanessa (who also had HFM) played barbies together. 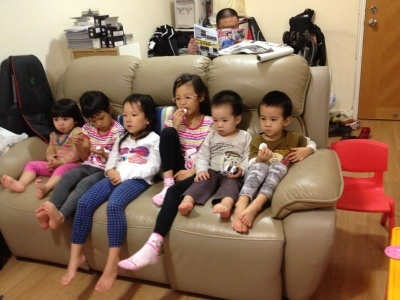 The kids all got to watch a bit of TV while the adults eat dinner. Lauren spent some quality time at Carol's alone with her yee-yee's while Natalie and Nicholas were at mandarin class today. Here she is enjoying a light snack. Lauren also enjoyed a slightly heavier snack of Michael's thigh. 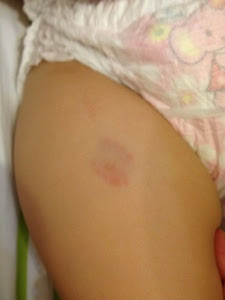 She bit him --again!